Accolades: Ranked 1st in Georgia on Golf Course Gurus' Best in State list. 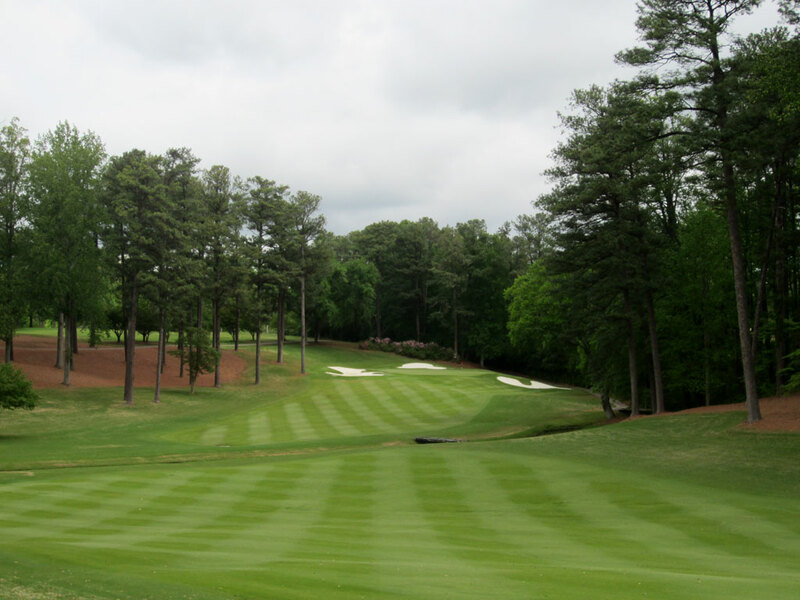 What to Expect: Peachtree is a very exclusive classic Robert Trent Jones and Bobby Jones design in northeast Atlanta that enjoys large pine and dogwood trees, Augusta-like bunkers, and rolling terrain with azalea flowers. The conditioning is impeccable in every sense of the word with every blade of zoysia grass seemingly perfect in health and length. 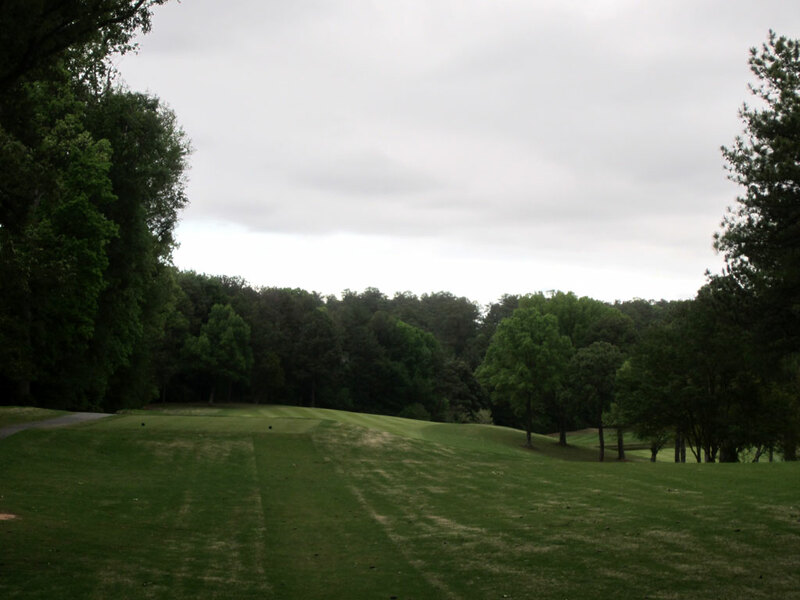 The course is bordered by busy streets and development, but you would never know it due to the surrounding trees that screen the views and buffer the noise so effectively. 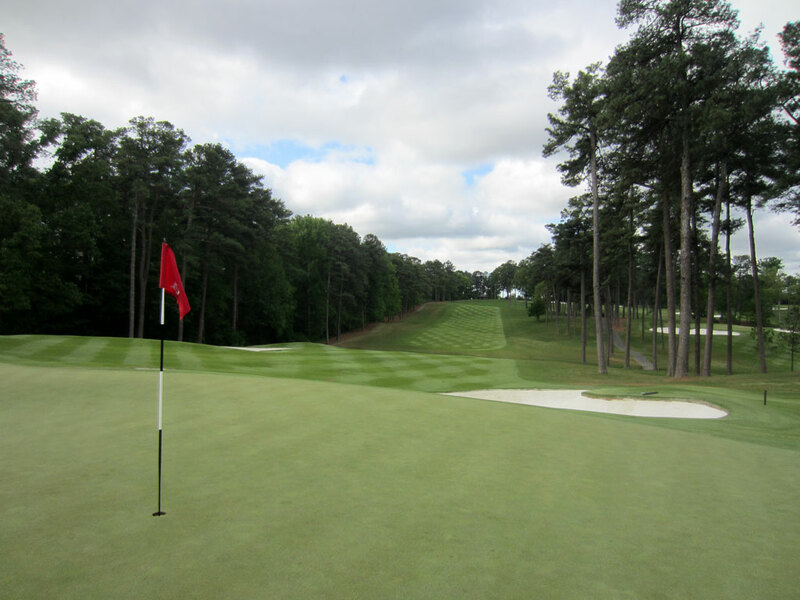 The design elements and feel of the course draw a lot of similarities to Augusta National which shouldn’t be a big surprise given Bobby Jones’ influence on the layout. 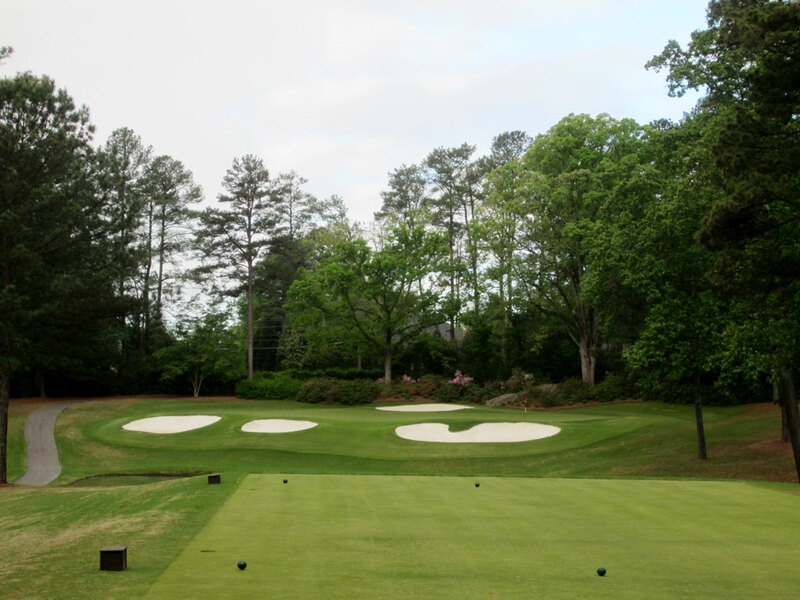 There are only five fairway bunkers found on the course paired with the comfortable driving corridors combine to create Peachtree’s reputation as a very playable course. Hundreds of trees have been removed from property which has opened up the feel of the interior holes and delivered some welcome vistas across the course. The tips play more than ten strokes stiffer than the forward tees and delivers a stout, but fair, test to any golfer. The tee box may be the only flat lie you’ll find during the day and your caddy will help you read the large undulated greens that roll fast and true. In conclusion, Peachtree is a pure golfing experience that features a quaint pro shop and clubhouse. It is the type of course that you could play everyday and never grow tired of it and the design is such that you should be able to keep big numbers off your scorecard but will still have a difficult time breaking par. The terrain and conditioning at Peachtree are perfect for golf and deserves its place among the Top 100 finest tracks in the country. Signature Hole: 4th Hole – 166 Yard Par 3 – Anyone that is familiar with Augusta National will see similarities to it at Peachtree throughout their round and the 4th hole is one of the strongest similarities. 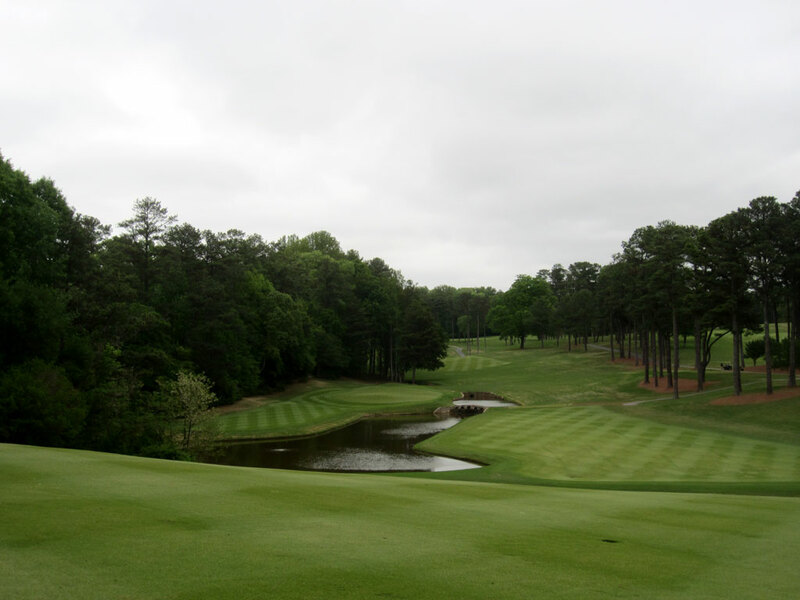 As you step on the tee you can almost envision yourself on Golden Bell, Augusta's famous 12th hole. Playing over water to a wide but relatively shallow green protected by a series of bunkers, this beautiful hole located in the northwest corner of the property certainly drew inspiration from its Amen Corner counterpart. 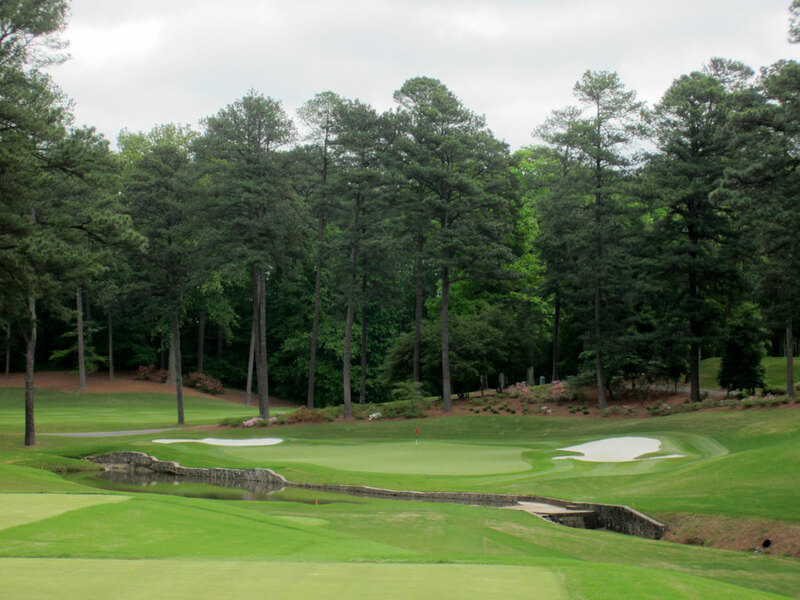 With attractive landscaping behind the green and a tree amphitheatre setting, Peachtree's 4th hole is an absolute gem early in the routing of North Atlanta's famed club. Best Par 3: 14th Hole – 183 Yards – Another par three that plays over water, the creek that runs through Peachtree was widen into a pond in front of the 14th green in order to create a more imminent hazard. The green sits at a 45 degree angle as it runs from front right to back left away from the player. 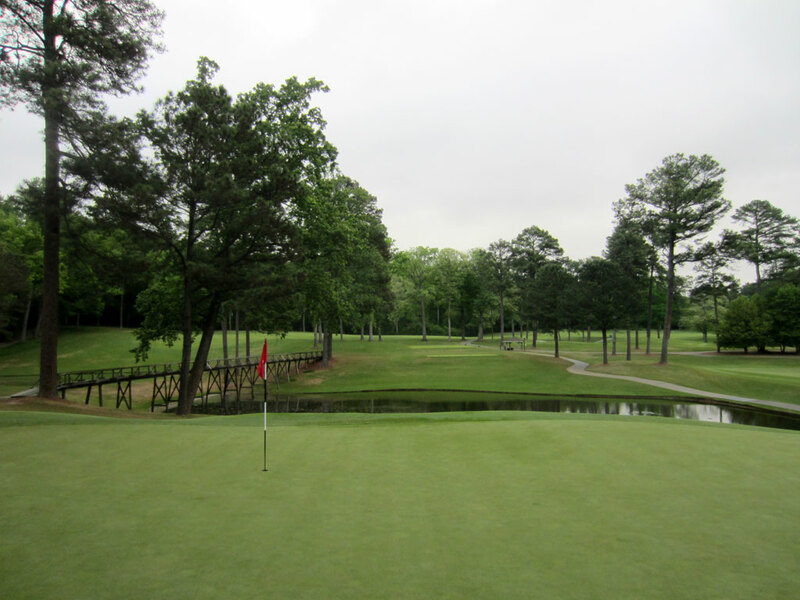 A bailout area is offered on the right side of the hole and may be considered a smart play when the flag is in the "sucker pin" location in the back left of the putting surface. A large bunker covers the right side of the green starting 1/4 of the way back while a bunker half that size catches ball going long and left. The hole plays slightly downhill which will make about a 1/2 club difference on your club selection, so choose wisely and swing with confidence. Best Par 4: 12th Hole – 486 Yards – From the tee you have no idea how great this hole is. 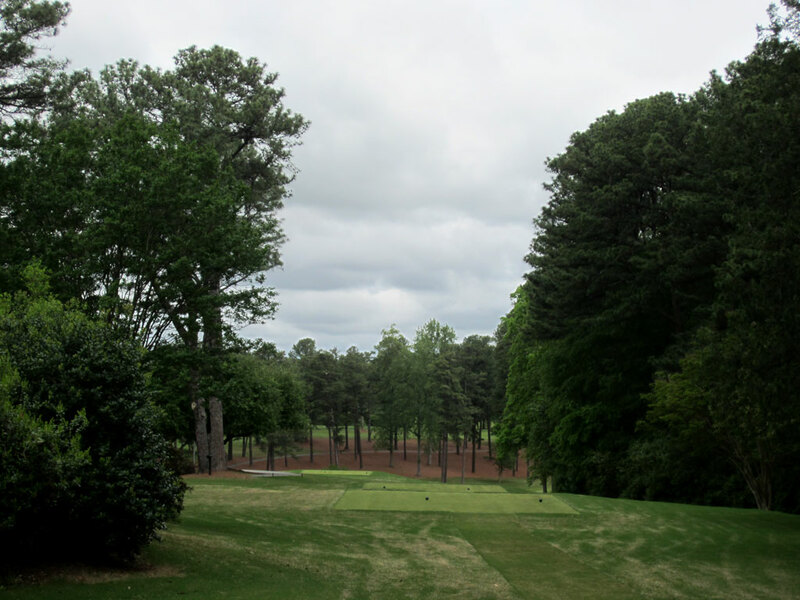 The back tee sits just a few yards from Peachtree Road in a chute of trees that restricts any hope of seeing the green. After roping your drive down the middle of the fairway, the hole doglegs right and heads downhill towards the green. The visual from the fairway is one of the most inspiring views of the day as your eyes see the creek cutting across the fairway while trees frame the hole to the raised green protected by a trio of bunkers. Two very good golf shots are required to reach this green in regulation and represents what could be the most satisfying par of the day. 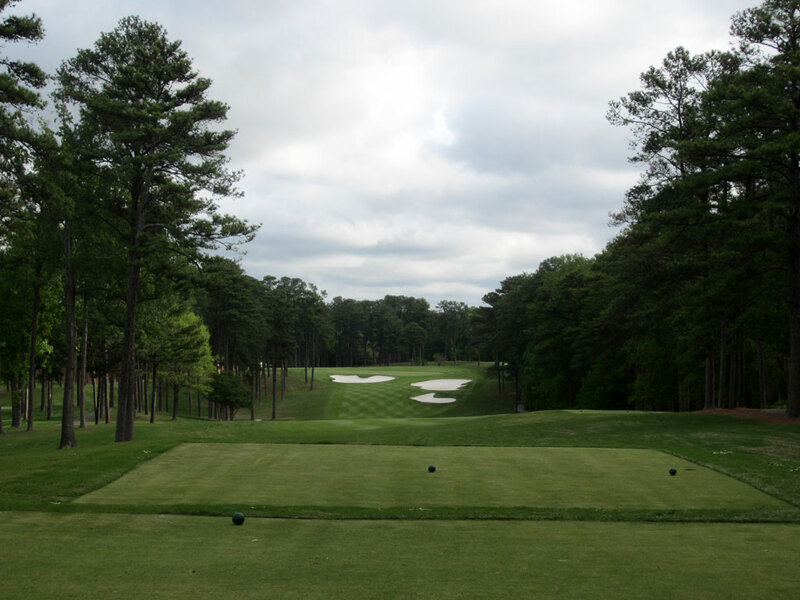 Best Par 5: 2nd Hole – 584 Yards – Wow! Wow, wow, wow! Having played approximately 8,000 different golf holes, it gets to the point where it takes something pretty special form me to be impressed, let alone blown away, by a single golf hole. Well, the 2nd hole at Peachtree had me dragging my jaw across the turf as I crested the fairway and was given a few of the world class approach shot to the green. The main fairway, sitting 30 feet or so above the rest of the hole, delivers a spectacular view of two different fairways in which to aim at which are separated by a pond. The fairway on the right offers much more safety with 3-4 times more turf in which to hit to, but then requires a delicate wedge shot over the hazard to the green. Up the left side is a sliver of a fairway to aim at but run directly up to the putting surface. Players bold enough to go left with their approach shot will be left with a simple pitch to the green and a chance to get a birdie. The risk/reward options on this hole are flat out awesome en route to one of the finest golf holes in America. Birdie Time: 10th Hole – 519 Yard Par 5 – Playing well downhill from the tee, caution should be thrown to the wind on this very reachable par five. Once reaching the bottom of the fairway players will see a creek that crosses through but is of little consideration when considering your strategy on the hole. The fairway climbs back uphill towards the green that features two bunkers well short of the putting surface and a single bunker protecting the front left side. Even blowing your second shot into the greenside bunker is of little consequence as players are offered a straight forward, uphill out to a large green. Many players will be able to reach this green in two with a long iron approach, and those that don't, should still have a great chance of getting up and down for a birdie. 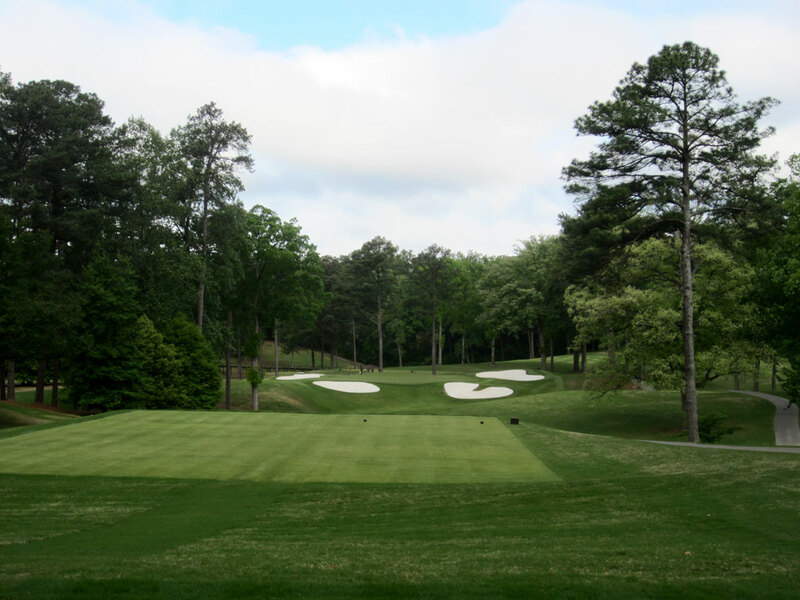 Bogey Beware: 6th Hole – 234 Yard Par 3 – The collection of par 3s at Peachtree are impressive to say the least and the second one-shotter at the club is another great example. The most difficult of the par 3s at Peachtree, the hole is a bit reminiscent of the 4th at Augusta in terms of length coupled with playing downhill. 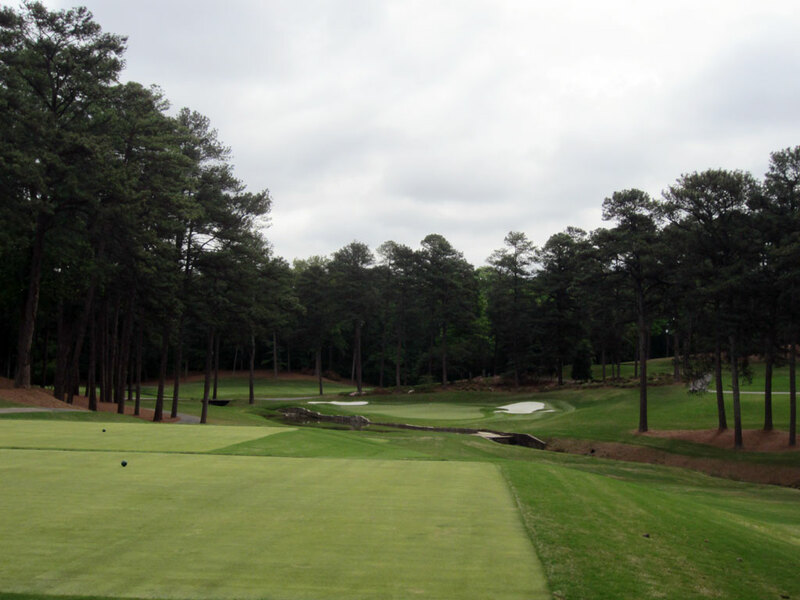 The bunkering is completely different as Peachtree's offering boasts two bunkers in the front and two more in the back with only a direct line to the middle of the green being safe. The sloping green is extremely difficult to navigate and will produce as many 3-putts as any putting surface at the course. The longest approach shot of the day coupled with Peachtree's most challenging green brings bogey onto the radar as an eminent threat.